Have you liked our Facebook page? Well, now it’s time to follow @CambridgeSchool_Baltimore on Instagram! We launched our page as part of this year’s Learning Expo or #InventionConvention. The week of activities included classroom rotations, Pi Day, and Dress Like Your Favorite Inventor/Invention Day. Students FaceTimed with multiple inventors from our own parent community and states far and wide. Mrs. Mund created Rapunzel’s tower in her classroom and asked students to “invent” a new ending to the story. Dr. Buresh recreated Project Gemini in his classroom. In the third grade classroom, students learned about Archimedes, who discovered Pi and improved the catapult. On 3/14, Pi Day, students celebrated with a pie-eating contest and the opportunity to “pie” Mrs. Taguding in the face. 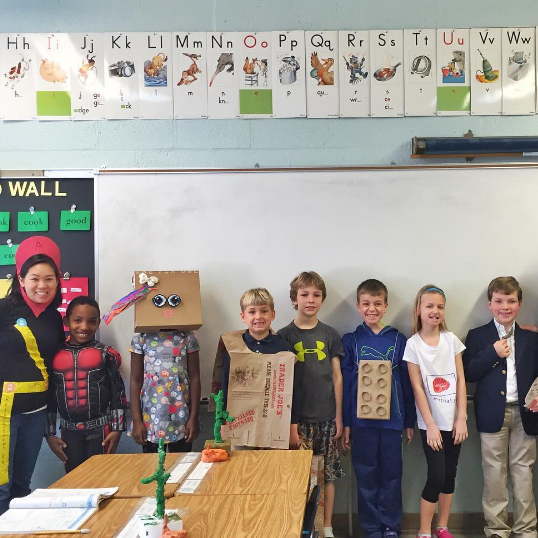 The week ended with students dressing as their favorite inventors/inventions. Faculty members dressed as their favorite mobile apps.